"Although she has only been at Sonoma State for one short year, she has already changed our university in historical ways to better the student experience," said Associated Students President Emily Hinton, who nominated Sakaki for the award. "The students of Sonoma State are incredibly proud and grateful to call you our president." CSSA is the single recognized voice for more than 425,000 students in the California State University system. Founded in 1959, the association is the acknowledged statewide student organization designed to represent, serve and protect the collective interests of CSU students. 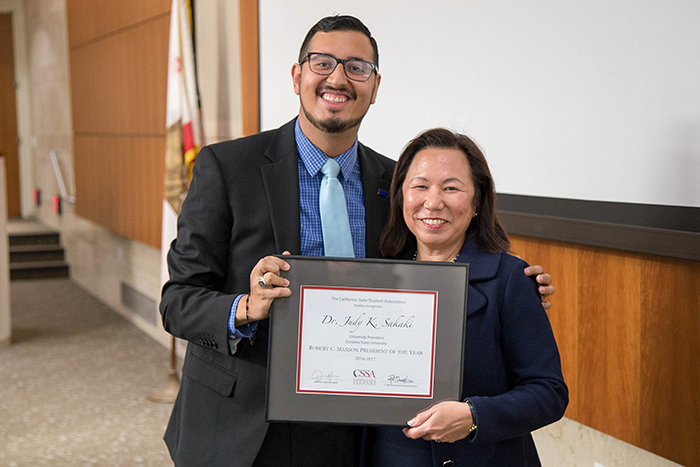 "Although other campus presidents were recognized by their students for their stellar leadership, it was Dr. Sakaki's compassion and human touch that set her apart this year," CSSA President David Lopez said at the Board of Trustees meeting. The Robert C. Maxson President of the Year award is given each year by the association to one CSU campus president whose leadership reflects a commitment to the mission of the CSSA, who has demonstrated exceptional inclusion of students within the context of shared governance and has assisted the CSSA in advancing its statewide policy agenda. "I am so honored to receive this award from the students of the California State University," said Sakaki. "What an incredible recognition to receive in my first year as president. Our talented students inspire and motivate me." President Sakaki began her tenure at Sonoma State July 1, 2016, and immediately set the tone of diversity, inclusivity and opportunity for all by inviting 400 underserved K-8 students from the Roberts Family Development Center in Sacramento to experience a taste of college life in her first week on campus. Since then, she has made tremendous strides toward refocusing the University on student success. In February, the University announced it had received federal designation as a Hispanic Serving Institution, creating eligibility for a multitude of grants and other funding geared toward student success for all students. In March, President Sakaki opened a resource center for undocumented students on campus. Staying true to her Convocation pledge to "listen and learn," President Sakaki has led numerous efforts to enhance student success, many of them generated by student concerns. She is integrating the university's world-class Green Music Center more with campus and the campus community, including holding the university's first indoor-outdoor Commencement ceremony this year in Weill Hall; University administration was re-organized to strengthen and revitalize the division of Student Affairs and improve overall efficiency; the parking policy was revised to allow more availability for students in reserved areas closer to campus; library access was expanded for students during finals week; and many more initiatives have been accomplished or started. "Most importantly," said Hinton, "Dr. Sakaki has begun to change the culture at Sonoma State University to be more community and student driven. She has focused on diversity and inclusivity to ensure that every student at SSU has an equal opportunity." Sakaki was honored earlier this year with the Pillars of the Profession award from NASPA - Student Affairs Administrators in Higher Education, given to distinguished individuals who have served as leaders, teachers, and scholars in student affairs and higher education. She is the first Japanese American woman in the nation to lead a four-year college or university. Dr. Sakaki's career in higher education has been devoted to developing, leading and implementing best practices in access, affordability, inclusion and diversity, and student success. Prior to Sonoma State, she served as vice president for student affairs for the University of California Office of the President; vice chancellor for student affairs at UC Davis; and vice president for student affairs and dean of students at Fresno State. Dr. Sakaki is a double alumna of the CSU, having earned both a bachelor's degree in human development and master's degree in educational psychology from CSU East Bay. She holds a Ph.D. in education from UC Berkeley. A video of President Sakaki receiving the award can be seen here.